Despite Rae’s considerable creds, it’s going to take more than one person to make powerful roles for women of color a normal occurrence in art and media though, as Idris Goodwin’s 2012 stage drama, “Blackademics,” so palpably suggests. 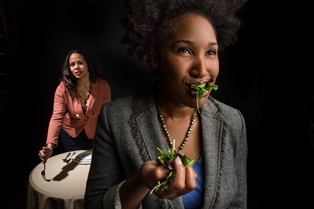 The surrealist chamber play explores the struggles of African-American female academics as they attempt to navigate a system that has largely been set up by and for white people. It’s a system that both excludes and fetishizes anyone outside the old boys’ club: As one of the characters in Goodwin’s drama puts it, while it’s OK for a member of the club to focus exclusively on a single, very narrow scholarly field e.g. the work of Alfred Lord Tennyson, a black female college professor is expected to know about every single idea ever written or thought by anyone who isn’t white. An already very broad field like African-American literature is apparently no longer valid in this competitive, academic world. 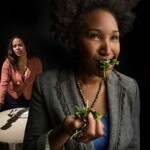 In Crowded Fire Theater‘s smart production, elastically-directed by Mina Morita (the company’s new artistic director), Ann, played with great poise by Safiya Fredericks, invites an old friend, Rachelle, embodied with soft toughness by Lauren Spencer, to lunch at a trendy cafe to celebrate getting tenure at a highly-esteemed liberal arts college. Even before Ann shares her good news, there’s rivalry between the two professors: Rachelle’s career at a state school, known more for its “great bleachers” than anything scholarly, is stalling. She doesn’t take Ann’s promotion well. But the squabbling between the two characters is only part of Goodwin’s world view here: This kind of competition could just as easily be played out between white, male scholars. What’s particular to this scenario isn’t simply resentment that arises between two professionals on the make. It’s the fight against a system that almost completely excludes black women. The system, in this case, takes the form of a matronly and mild-mannered white waitress, played with creepy authority by Michele Aprina Leavy. The waitress’ name is Georgia, a constant reminder of the South’s slave history and how little society has progressed since then, in some ways. From the moment she persuades her only two dinner guests to eat seeds from the palm of her hand near the start of the play, Georgia has the upper hand almost entirely. The waitress listens in, off stage, to the diners, and brings them food and drink based on how well she thinks each one does in their game of self- and system-imposed one-upmanship. When Ann gets ahead of Rachelle, she scores a point from Georgia and wins a salad. But Georgia keeps her guests on a tight leash. They have to fight to earn a table. There’s only one chair, no cutlery or glasses and only one person gets to eat at any one time. It’s an unsettling dictatorship, made all the more so by the cutting boards that adorn the otherwise modishly plain wooden cafe walls like so many unblinking eyes, and the smooth jazz that plays in the background when the atmosphere becomes unremittingly hostile. The cafe, from which Rachelle and Ann cannot escape, and the creepy waitress, reminds us of “No Exit” by Jean Paul Sartre, not to mention countless other existential plays of the 20th century by bastions of academic study like Samuel Beckett. The fact that Goodwin’s play smacks so strongly of mainstream, white literary history adds a layer of caustic metatheatrical humor to the dramatist’s effort to grant visibility to African-American culture. In Sartre there is no way out of hell. That’s what makes the surreal play seem very real. But Goodwin’s denouement is more optimistic, and, I think, overly simplistic. Rachelle and Ann can continue to bicker — and lose. Or they can team up against Georgia — and possibly win. Yet the message is a powerful one when it comes to thinking about real-life examples like Issa Rae. Rae is scoring wins for the visibility of black actresses in the real world. But the establishment she’s up against is daunting.